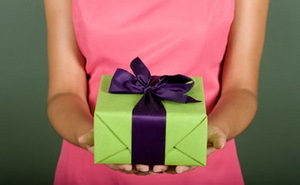 Nowadays a lot of the men are facing so many challenges when they are choosing a gift for their girlfriends. On the one hand this gift should be romantic, and on the other hand it should be practical and it should also match the men’ status. “I dressed the world, but look at them now, walking around naked!” Coco Chanel. It is very important to follow the fashion trends, because recently bought stylish things may simply be an object of ridicule today. So let's talk about today’s best presents for your beautiful and lovely girlfriend. Therefore, if you are a busy person and you do not have much free time to look for the gift, a bouquet of flowers would be an appropriate present. Recently there has been a tendency of avoiding the usual bouquets, that’s why lots of flower shops and author workshops offer you different flower combinations and compositions. But still any girl can’t resist the armful of large Dutch roses and, believe, all social networks would be full of their “selfies” with these beautiful flowers. If your financial status allows you to make more expensive gifts, there is no any girl, who will refuse a new smartphone. She will be able to make a lot of different pictures, sharing these pics she will be thinking of you. Also, if you are afraid to make a mistake in choosing a gift, there is a great opportunity to reduce the risks to a minimum. Nowadays a remarkable trend in gifts to your girlfriend is a gift certificate to the spa or beauty salon where she will be able to select a set of necessary procedures individually for her. A gift photoshoot from the famous photographer is also one of the extraordinary gifts for your loved one. Diamonds are a girl's best friend! Believe me, any girl can’t resist the gold jewelry, in which gemstone is harmoniously integrated. A variety of today ‘s gifts cannot just turn your girlfriend’s head, but yours until you make a decision. So use our advices and be happy.